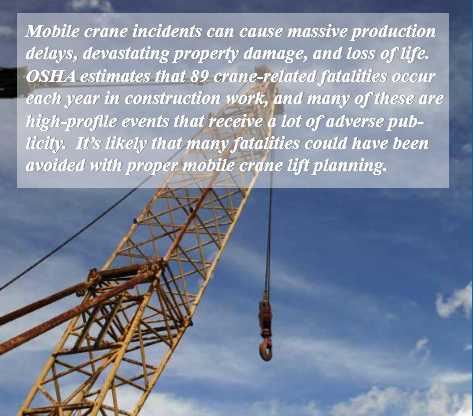 The first step in creating a lift plan is to understand the factors affecting the strength and stability of mobile cranes. Some of these factors are described below. Machine configuration. Load chart ratings may only be applied if the machine is rigged according to the manufacturer’s specifications. • Is the jib erected or stowed? • What type of jib is used? • Are the outriggers extended properly? • Are the tires properly inflated? • What type of boom is used? What is the boom length? Where are the boom insert locations? • What counterweights are used? Are they configured according to the manufacturer’s specifications? • What is the wire rope size and grade? • What is the configuration of the hoist reeving? Most important, operators must know the configuration of the crane, ensure the configuration is correct, and use the appropriate load chart. Unbalanced rope reeving. Unbalanced rope reeving occurs whenever the main hoist line is reeved to one side of the boom tip. This condition causes the boom to twist, which subsequently reduces the rated capacity of the crane. Full chart ratings may only be applied when the boom tip is symmetrically rigged. On singleline reeving, when the hoist line runs along the center sheave or on the sheave beside the centerline of the boom, the boom twist is minimized. On multi-part reeved systems, if the parts of the line are evenly distributed on either side of the boom centerline, the boom twist will also be minimized. Be sure to check the manufacturer’s reeving diagrams to ensure proper reeving. Improper use of outriggers. 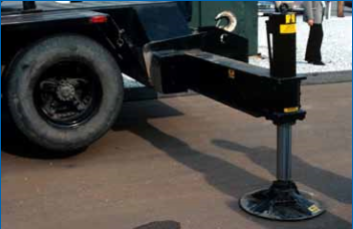 If lifting on outriggers, the load chart rating applies only when all the outrigger beams are fully extended and all tires are clear of the ground. If these two conditions are not met, then the “on rubber” capacity charts should be used. If lifting on rubber, the load chart ratings apply only when tires are in accordance with the manufacturer’s specifications and in good condition, and the specified tire pressure is maintained. Some mobile cranes have load charts for mid-extended outrigger beams. For such cranes, the outriggers should still be extended to the proper point and all of the tires must be clear of the ground. Soft footing. The ground condition must have enough stability and bearing capacity to support all loads placed on it by the crane. Extreme caution should be used when performing lift operations beside buildings, especially if newly constructed with uncompacted backfill, along trenches, or in areas where water mains, sewer pipes or steam lines are buried. When a crane sets on its load bearing surfaces, it exerts varying pressures depending on the operating conditions and the quadrant(s) of operation. The lowest bearing pressure is the total weight of the machine distributed over the entire area of the drive tracks or all outrigger supports. Lifting a load over the corner produces the maximum ground bearing pressure, which makes it the most dangerous position. The ground pressure of a truck crane may be higher than that of a crawler crane due to the smaller load bearing surface area of the pads. Pads used for outriggers should be stable and rigid, a minimum of three times larger in area than the outrigger float, and be fully supported (Garby, 331; Campbell and Dickie, 206). Unlevel crane. The load chart ratings are based on the crane being perfectly level in all directions. A crane that is not level causes side loading of the boom, thus reducing the rated capacity. A crane that is 3 degrees out of level may reduce the rated capacity by as much as 50 percent (Campbell and Dickie, 162; Garby, 336). This applies to “on crawlers,” “on riggers,” as well as “on rubber” lifting operations. The target level in the crane cab should be used for initial leveling; however, for critical lifts, a carpenter’s level should be used. After initial leveling, place the carpenter’s level on the leveling plates provided on the crane, typically located on or under the boom foot pins, then rotate the boom 90 degrees and recheck. The levelness can be double-checked by raising the boom and lowering the load line. The line should lie in the center of the boom in all positions (i.e., end, side, and corner). If making a series of lifts, the levelness should be periodically checked. Side loading. The load chart ratings apply only to freely suspended loads and when the load is picked up directly under the boom tip. 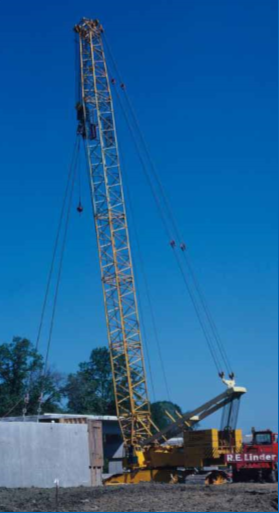 If the load is to either side of the boom tip, side loading occurs, which affects the crane’s capacity. Side loading is one of the most common causes of boom failure and usually occurs without warning. 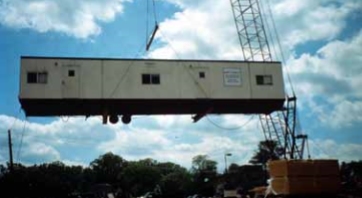 Side loading can occur when a load is dragged or pulled sideways, when the load starts swinging rapidly, when the crane is not level, and when exposed to high wind speeds. Tilt-up construction methods can also cause side loading of the boom. Increasing load radius. The load radius may increase during a lift if the hoist line is not vertical at all times. An increasing load radius may be caused by lifting a load that is outside or inside of the boom tip radius. For such lifts, the load will start to swing in and out after the load clears the ground, which increases the load radius, thus reducing the rated capacity of the crane. Lifting “on rubber” can also cause the load radius to increase due to deflections in the boom, tire, and carrier. Shock loading. Load charts do not allow for impact loads. Shock loads can be caused by rapid acceleration, sudden stopping, sudden load release, and sudden load snatching. For instance, the shock loading increases by approximately 35 percent if the hoist line is traveling at a speed of 400 feet per minute and stops with a stopping distance of only two feet; but the shock loading only increases by approximately 0.5 percent if the hoist line is traveling at a speed of 100 feet per minute and with a stopping distance of 10 feet (Campbell and Dickie, 171). In addition to sudden deceleration and the other conditions mentioned above, pick-and-carry operations also produce impact loads to the machine. High duty cycle. Load chart ratings may not apply when cranes are used in high-speed production operations. The manufacturer will either specify in the load chart that the rated capacities must be reduced by a percentage for high duty cycle operations or will supply a separate load chart for such operations. The capacity reductions are recommended since the speed of these operations produces side loading as well as higher temperatures in critical components such as brakes, clutches, pumps, and motors. High wind speeds. High wind speeds affect the capacity of a mobile crane by increasing the side loading on the boom and the load radius and by decreasing the tipping (both forward and backward) capacity. In addition, performing lifts in windy conditions makes it more difficult to handle the load. Hoisting activities should be restricted or stopped completely (and the boom properly secured) in windy conditions. Because many factors affect a mobile crane’s rated capacity, using a pre-lift checklist when planning a lift is generally a good practice. If a lift cannot be made under the configuration and conditions specified in the lift plan, the lift should be re-evaluated and approved by a qualified person. Bibliography Campbell, D., & Dickie, E. (1982). Mobile Crane Manual. Toronto, Ontario, Canada: Construction Safety Association of Ontario. Garby, R. (1999). IPT’s Crane and Rigging Training Manual. Edmonton, Alberta, Canada: IPT Publishing and Training, Ltd. Spear, J. (2004). Mobile Crane Lift Planning. Retrieved June 18, 2010, from J.E. Spear Consulting, LP.